The documentary kicks off at the annual Followill family reunion in the back woods of Talihina, OK, where the boys return to their roots and unwind with their family. 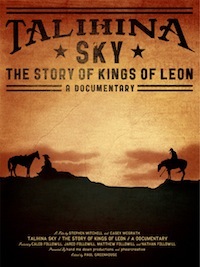 First-time director and Followill friend Stephen C. Mitchell weaves personal home videos, unedited interviews and behind-the-scenes footage of the band’s journey from their small-town beginnings — spent in poverty and touring the circuit with their father, a Pentecostal evangelist minister, and their devout mother — to living the rock star dream. Lindsey Buckingham Songs From The Small Machine – Live In L.A. Previous THE VINYL WORD: THE DECEMBERISTS ‘LONG LIVE THE KING’!! !